Boskel was incorporated in August 1989 and commenced business immediately to provide thermal process engineering and environmental management solutions. Boskel is wholly owned by Nigerians and operates with 100% Nigerian staff focusing on developing local content solutions while maintaining international standards. In January of 1991, Boskel embarked on the development of its patented passive Smokeless Flare System for the Oil & Gas industry. 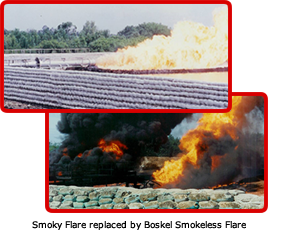 The Shell Petroleum Development Company (SPDC) immediately became interested and after conducting several pilot tests with Boskel Smokeless Flares began replacing it's older smokey flare systems with Boskel Smokeless Flares. In July of 1992, the first commercial Boskel Smokeless Flare was installed at Kokori flow station of Shell Petroleum Development Company. Since then over 200+ Boskel Smokeless Flare units have been built and installed for Shell Petroleum Development Company, AGIP, etc in Nigeria and other locations including Oman. Boskel Smokeless Flare technology is continually being developed to address changes in the constraints of the industry while achieving optimal performance. Following the success of our Smokeless Flare system, Boskel began developing incinerators for hazardous and municipal wastes in 1995. After development of several pilot units, Boskel Incinerator technology matured enough to meet industrial standards and optimum cost effectiveness. Currently, we have built and designed fully operational units for disposal of most hazardous industrial wastes in various industries and disposal of municipal wastes for various government agencies. Today, Boskel operates and manages a fully staffed and equipped incineration facility complete with a Rotary Kiln Incinerator, a Thermal Desorption Unit, a drum crushing unit, and emission control monitoring units necessary for proper disposal operation. This Boskel Waste Management facility is one of the few facilities authorized by the Nigerian Environmental Agencies to issue certificates of disposal in compliance with Environmental safety laws. Boskel is a company that prides itself in delivering appropriate solutions to meet a wide range of constraints by maintaining a highly trained technical staff and challenging conventional solutions to problems in industrial processes. Our commitment is to our clients, so we ostensibly promise to find a solution if one exists, and our "No Cure, No Pay" guarantee illustrates this commitment. 1989 - Boskel is founded by Dr. Keluo Chukwuogo (MFR). 1991 - Development of Boskel’s smokeless flare system. 1992 - First Boskel flare system commissioned in shell. 1996 - Development of oil slop burners. 1997 - Development of boskel’s incinerators. 1999 - Waste management facility set up in Port-Harcourt. Nigeria Society of Engineers (NSE). 2004 - Development of Boskel’s high turndown flare. 2005 - First foreign orders for flares received from Oman. 2006 - Export of flares start to the Middle East. 2007 - First foreign flare commissioned in Oman. 2007 - First order for medical waste incinerator received. 2008 - Commissioning of first medical waste incinerator. 2009 - Commissioning of incinerators at LUTH, Owo, Ilorin, & Abuja. 2009 - Order for incinerator for National Hospital, Abuja, FCT received. 2009 - Signed MOU with MECEN-IPC of South Korea on PET plastics recycling. 2010 - Commissioning of National Hospital incinerator. 2011 - Commissioning of incinerators at Zaria, Gussau, Katsina, etc. 2013 - Order for Integrated Waste Management facility for Delta State.